In relationships that don’t support you or fully honor you? You have relationships that drain you or degrade you, dishonor you in anyway. Hold on to friends, lovers, clients that are not supporting you to grow or be your best self? Lacking the kinds of friendships or the number of soul family you have around you? PROMISE YOU NEED: I only have loving respectful relationships. 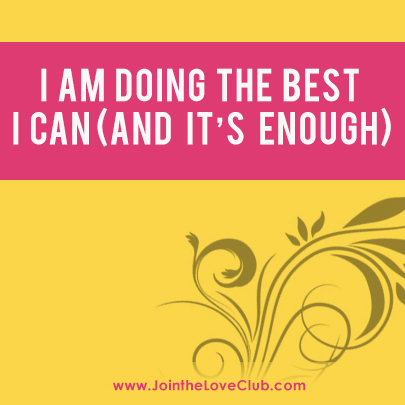 To learn more, go to www.JointheLoveClub.com — I’d love to support you to choose love for yourself. Yes, I settle!I left a job last year because I refused to settle anymore. I also, put others ahead of myself and don’t say caring thoughts enough to myself the way I do to others. I need to support myself the way I support other people. 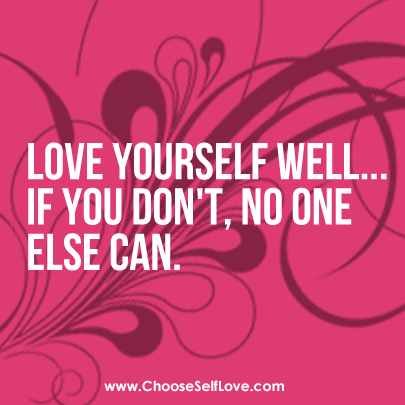 If we can’t love and take care of ourselves, we can’t be of use to others. I chose to change!! thanks so much for your videos. It’s a year to return to self love. Uh-oh!…. Looks like I am majorly lacking self-love. Hearing the 6 signs made it really clear. I already knew it- but how to correct it is hard. Something that prevents me from figuring that out came out in the video: the seeming conflict between not settling and being hard on yourself. I am SO hard on myself. But its mostly because I have not achieved the life I want to have or am proud of. Because I don’t want to settle for something that is mediocre- but as a result I haven’t found “it” yet and and so constantly sad and embarrassed and hard on myself because I I haven’t been successful at thriving at something I love and a proud of. Almost 40 and it seems to elude me and makes me so sad. Christine, or anyone else, can you comment on not being OK -at all- where you are in your life (because you won’t settle and want something more and haven’t gotten there yet) and being really hard (down) on yourself because your’e not there? The last few years I have been settling, and even enduring a life that I knew deep inside me wasn’t right and wasn’t making me happy. But I thought I don’t deserve a happy life, I thought I will never be able to realize my dreams, I thought I had to accept what was even though it was breaking my heart, I thought something was wrong with myself. I’ve been so unhappy!!! I am now changing this, although it’s so hard cause my dream is so huge that it seems imposssible. Some days I am doing great, some days (like today) I am full of fear and doubt. But I am continuing my self-love journey best I know how, am taking steps towards my dream, and opening up to the divine as much as I can. I don’t have any close friends where I live to support me, so joined the Love Club. Hm, this doesn’t sound very coherent. Just needed someone to listen, I guess. 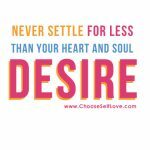 I no longer want to settle for less than my heart and soul desire!!! I promise to be forgiving, gentle, kind and compassionate with myself, always. To know I am enough in every way and that all I need is within. Reading the list of 6 areas needing self love has revealed my desperate need for all 6. My self love tree did not grow in worth as a very young child with a narscisstic mother. I have promised myself to be compassionate and kind and gentle with myself so that the roots of my tree will be nourished rather than shamed. I am repotting my tree in fresh soil of Worth. 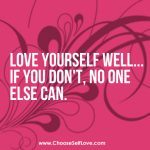 I promise not to be so hard on myself today, saying I am not accomplishing enough today in my head–turn it around by being compassionate to me instead. Each day I will take this pledge. 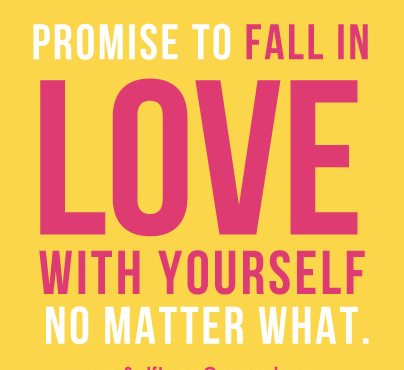 i promise to honor + respect myself by being in relationships that are supportive,caring and that encourage growth. I promise to take care of my self with no guilt. This week I am going to do what ever I have to do with calm, within its perfect time, no matter my Job mates may try to press and up set me as they usually do. No more stress for nothing. Thank you so much for your very beautiful inspiration! The signs where I am not giving myself self love is that I am hard with myself (I compare myself to others) and also I feel I am settling for less than my heart and soul desires (such as my current job, which I know is not my passion and what I enjoy). I am very excited to grow all branches in my self love tree. 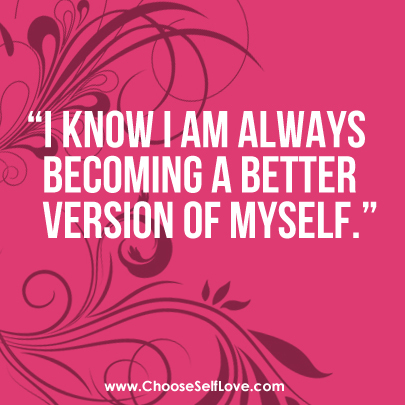 The self branch that I will strongly focus on this year is Self-Acceptance <3 I am making a vow to love myself fully (fall madly in love with me) just that way I am and no matter what! Thank you so much for all your great help, support, and inspiration! I am very grateful! Much much love! Thanks for the inspiration. It’s not easy to get rid of old habits even when they’re destructive to body and soul. I hope for myself to do just that in 2014 and your thoughts are a gentle reminder to be healthy in all areas of my life. I settle for less than my heart desires……hell, I don’t even really know what my heart desires. I stay true to myself eveb if it means letting down another!!!!! I passed the test!!!! 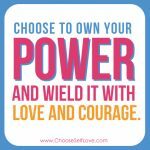 I am giving my self love in all the areas you mentioned, and I am SO GRATEFUL to you, Christine, for being the barometer that lets me know if I am doing this all the way I should. Ever since I decided to leap into the life that God and the Holy Spirit wanted for me, I have been saying YES to the desires of my heart, and oh my, nothing is more liberating than that!!! It has gotten so good that now I am choosing where to step back so that I don’t overwhelm and overwork myself. If you are reading this and trying to decide whether or not to sign up for Christine’s program, DON’T DELAY–this woman is right on the mark!!!! She has led me to a life of my deepest happiness because I was willing to risk loving myself so that I COULD love others. Christine Arylo has it right, friends; don’t miss out on signing up for her programs. THEY WORK. I pledge to be more accepting of myself. As I get older, now almost 50, I so want peace with my appearance. I want to look in the mirror and just say “Boo, you are awesome!! ” plus, I want to join the love cluband share the love with everyone!! I promise to expand my circle of loving, meaningful relationships. I will take 1 hour on Wednesday mornings to look through the online dating resource that I use, and contact one person during that hour that I think would increase kindness and love in my life. I will commit myself to more self love. I relate to ALL 6 signs! Soo bad. I will make this a year to love myself and nourish my soul! Thank you for all the positive messages. I just told myself that this last weekend was my retreat that I was doing for myself. I told my fiancé this and didn’t respond to the little inner-guilt-talk that wanted to start with me. I lifted it higher in my mind, like this is what I would feel if I was doing someone for someone else— then reversed back to FEEL it for myself. It worked and the fiancé was just perfect with it all. I said that this is preparation for us because if we were living together then it would mean I would go get hotel room and just need to time alone and self-nurturing that I seem to need to recharge myself. This is good practice now, don’t you think? Marriages seem to have a built in assumption that nobody’s time can be done alone- it all has to be shared or there needs to be a good reason to want to be alone without explaining or offending the other. the doctor has signed me off for a bit with depression. I am nothing , I am not contributing to society and earning a wage…. This year I will take care of myself without any guilt. For me I am the most important person. Just first I want to say how inspiring you are!It is a big shame I live in Holland though..I would love to come to your love club!! In my relationship of 4 years, I always seem to be sad and dissappointed when my boyfriend is around and make excuses for him and try to accept whohe is but I am feeling worse ans worse each day. Looking at the ‘not so acceptable’parts of my body and judging! I am taking the first steps to starting my own business but hold myself down by putting too much energy into others including my boyfriend..And the last few weeks I am overeating like no-one’s business..so not sure what is going on there.. But I will make a commitment to give myself more self love because Ir really really work so hard to change my patterns and give myself what I deserve but it is soooo alien to me and difficult!! This year I make the commitment with myself to grow in self-love, to take care of myself first and acknowledge all the hard work I’ve already done and I do every day, and to remember I AM ENOUGH. Christine, thanks for more reinforcements that will lead to my path of self-love. A really big issue for me. Yes, I have settled most of my life primarily in relationships. In my most recent relationship that ended, I did everything right but he wasn’t ready. How do I accept that and still feel good about myself? And now I am settling in yet another type of relationship that is tearing me up. Thus, the main reason I am posting this today. 1. I promise myself to take care of myself without guilt and fear! 2. I promise to myself to honor and to respect myself by only being in relationships that are lovable, respectful, supportive, caring and that encourage growth. 3. I promise to myself to treat my body like a temple. I promise myself not to settle anymore. I will now focus 100% on creating my dream life. I need work in all of them but I think the not settling one has become a really big one for me lately. I’ve felt so restless and stuck with the way my life has been, seemingly all shades of gray with very little color. And I’m sick of gray!! I want bright splashes of fuschia and turquoise and lime green and yellow! Rhonda – woo hoo to not settling – i love this promised, saved my life. may it open yours to all those colors of the technicolor rainbow ! I apologize for my feelings, like… All the time ! I am so hard on myself. These last weeks, the “trap” was : I am doing or thinking something I know is not good, but I can’t help it. So, I do not only blame myself for the thing, but also for knowing, and doing it all the same, so I blame myself for not applying my own advices to myself. And self-hate becomes like a spiral, like a snake eating its own tail, and it hurts soooooooo bad. I also compare… A (huge) lot. And I don’t accept my body. I have a friend who is probably the handsomest person I have ever met (he is a dude). When I look at myself after looking at him, I feel disappointed, small, and not-enough. This is not the way I should treat my temple. It may be a not-so-tall temple and a not-so-handsomely-shaped one, but it is a temple, and a sacred being, so I can love her with all my heart. So I make a self-love promise that this year, I’m going to tend my self-live branches that need doing so. I take care of myself first, without guilt. I will not put me first and let the chips fall where they may! I seem to have almost all the signs of lacking self-love. we never learnt that there is something like loving one’s self. but life taught me the hardest way (the best way), essential lessons on this. that’s how i reached here, to be able to connect with you. for this week i promise that i shall meditate every single day of this week, without fail. no excuses given or accepted. I knew that I haven’t been loving on myself… But after hearing your 6 signs and relating to all of it, I’m so ready to transform this and to start falling in love with me like never before! Every night after 8pm I am going to rest. No cleaning, no working or anything else other than relaxing and having me time. how and where can i get a copy of the “never settle” painting? Love it! I wondered for many years why I put others first, why I seeked approval from others when making decisions,why I stayed in an unhealthy relationship for years because I could not just walk away. I thought that because I had a good loving heart I sought out the best in other people and had faith in people being capable of change. I have the hardest time saying no, because I wanted to be remembered as a sweet, helpful individual. I would have never thought that I didnt love myself ENOUGH, but after reading this article I finally see that I need to work on me. I dont know where to start or how to begin but I am going to learn. My childrens father told me that people take my kindness for weakness, but now I see that others may be able to see that I dont love myself enough and they can take complete advantage. I’m kind of embarassed but at the same time happy to know what my biggest problem is and what I need to work on. I promise to myself to never ever ever settle for less than my heart and soul desire. I know that I am 100% capable of pursuing my dreams and not letting distractions get the best of me. I need a lot of self love, I feel unhappy most of the time. I met my husband when I was just 17 and he was my first love. I love him dearly, but feel a bit resentful that i have not experienced life as such and feel like I’ve missed out on alot. I promise not to be so hard on myself: I am gentle, kind and compassionate with myself, always. I will not blame or torture myself for the failure of my relationship. This week, I will take the time to allow myself to wallow in the pain of heartbreak, but I will not think of thoughts that will torture myself.